While strolling along East 23rd Street in Manhattan I notice a man coming towards me. 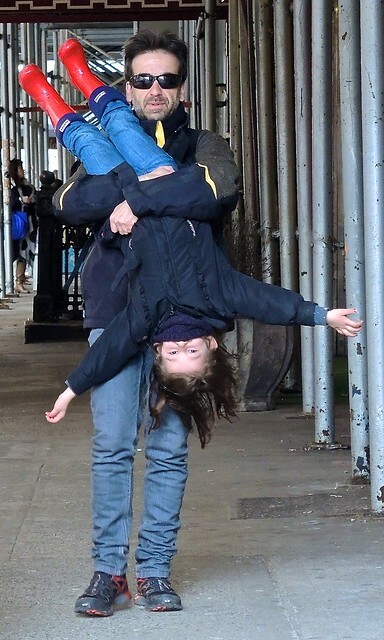 He is walking briskly, purposefully, while wordlessly carrying a child upside down. We draw closer. We are nearly abreast. “Upside down hello!,” I say. “Upside down hello,” responds the child. And then we begin to pass each other. “Upside down goodbye!,” I exclaim. “Upside down goodbye!,” the child echoes, as he and his silent beast of burden head west and I continue to walk towards the east. You are currently browsing the Blather From Brooklyn blog archives for February, 2015.